Decorating ideas for the surf zone. 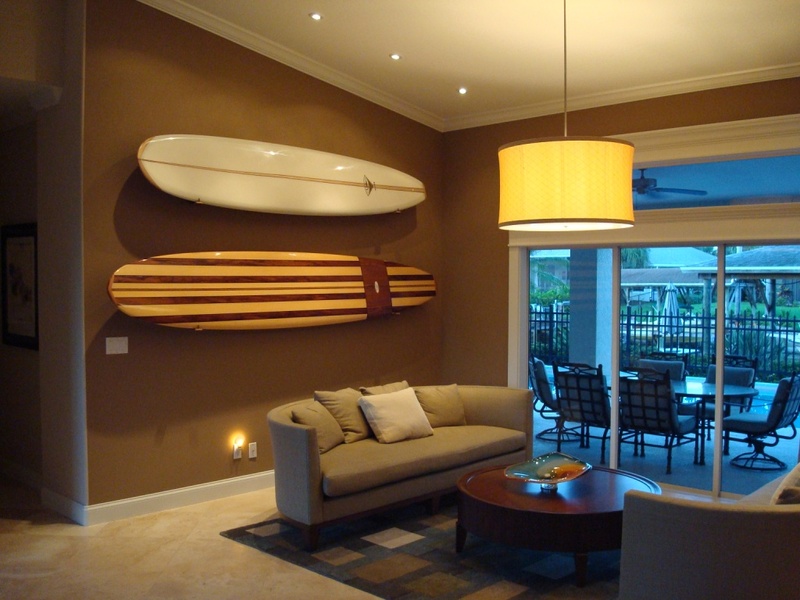 This is a spectacular use of surfboards as design elements with in the home. This is a wide angle 2 shot combined to give you a panorama of the room. Using 2 different types of surfboard racks from www.hawaiiangunrack.com they were able to unify their color schemes to match the furniture and create a warm inviting den using older collectable surfboards as artwork. On the right side of their den they placed a Yater and Velzy surfboard using horizontal racks that make the boards appear like they’re floating on the wall. Using darker and lighter brown tones to create accents to the walls is a great blending of color without overdoing one element. The stripes on the boards give an apparent accent causing the eye to follow the lines around the room to see the other elements of tinted blue glass highlighted by the natural outdoor lighting. 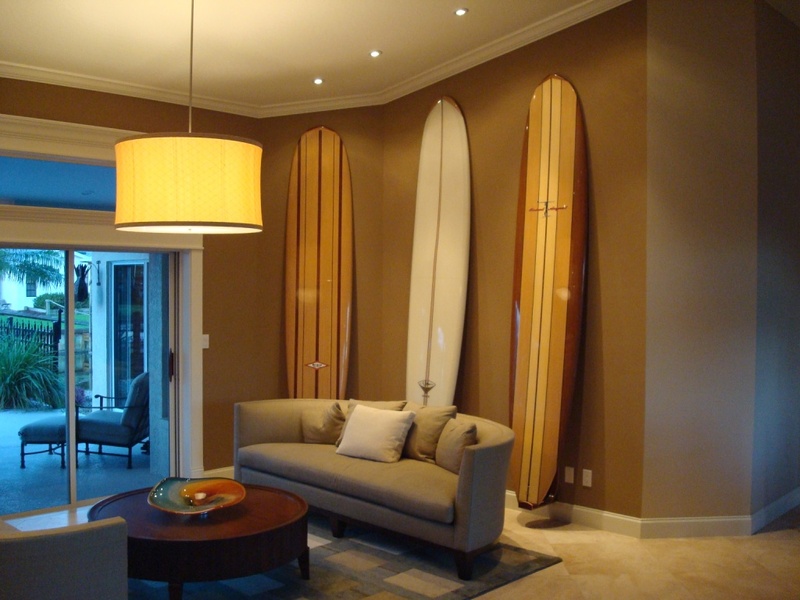 I especially like the recessed lighting on the slanted ceiling that place a warm glow on the surfboards. These classic boards shaped by Reynolds “Renny” Yater and Dale Velzy, who actually worked together back in 1957, are collector items offering a hint of nostalgia and style. Then they took the vertical wood racks, first of their kind, m ade by www.hawaiiangunrack.com to show their other boards in a museum style fashion creating an elegant quality to these beautifully designed surfboards. The racks are amazing because they aren’t big and bulky. They help to accent the board and not the rack, while offering an nice decorative element. They come complete with dowels that attach to the walls near the top of the board to keep the surfboard from moving side to side and an optional safety line. What is really nice about these racks …you can still take the boards out to surf …if you were so brave. This entry was posted in Showcases by surf5372. Bookmark the permalink.